Susanne Shultz and Mark Maslin of Britain's University of Manchester and University College respectively have published a paper in the journal PLOS ONE, outlining what they call a pulsed climate variability hypothesis. They suggest that early man developed a huge brain to deal with the constantly changing environment of the Great Rift Valley in Eastern Africa, during the formative years of human evolution. Prior research has found that the Great Rift Valley has experienced great changes over the past couple of million years. Because of its unique geography, the area has been particularly sensitive to changes in temperature and rainfall amounts. During periods of abundant rainfall, huge lakes formed along with lush vegetation—times of less rain saw lakes dry up and deserts creep in making life difficult for those that lived in the area. Shultz and Maslin suggest it was the severe changes in the local environment that tested the brains of the creatures that would eventually evolve to become modern man, causing an increase in size and complexity. To find out if they were on to something, the two researchers studied data obtained through years of research on the evolution of our planet, focusing specifically on East Africa. They found that wet and dry times in the Great Rift Valley could be marked on a timeline which could be compared with similar timelines created by those that study the evolution of man. In so doing, they found what appeared to be a correlation—brain size seemed to grow during times of change, apparently, as a means of adapting to changing circumstances. More specifically, they found that hominin diversity appeared to peak in the valley just under two million years ago, a period of time that coincides with very large lake size. It also marked the first known appearance of the class of hominins known as Homo, most notably Homo erectus. Similar changes in human evolution were found to align with periods of change in the valley that eventually led to our human ancestors leaving the valley altogether, heading both north and south, presumably, looking for a more stable environment. To bolster their theory, Shultz and Maslin next plan to focus on other animals that lived in the valley during roughly the same period as our human ancestors to see if they too experienced dramatic spurts of evolutionary growth. Early human evolution is characterised by pulsed speciation and dispersal events that cannot be explained fully by global or continental paleoclimate records. We propose that the collated record of ephemeral East African Rift System (EARS) lakes could be a proxy for the regional paleoclimate conditions experienced by early hominins. Here we show that the presence of these lakes is associated with low levels of dust deposition in both West African and Mediterranean records, but is not associated with long-term global cooling and aridification of East Africa. 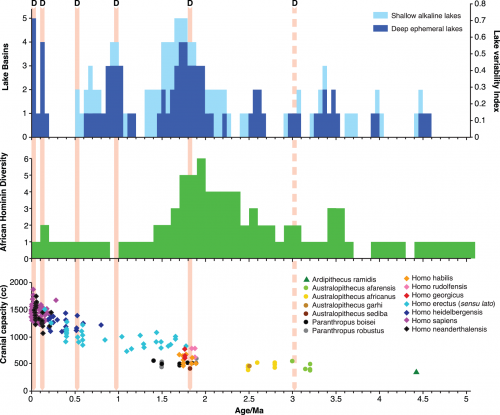 Hominin expansion and diversification seem to be associated with climate pulses characterized by the precession-forced appearance and disappearance of deep EARS lakes. The most profound period for hominin evolution occurs at about 1.9 Ma; with the highest recorded diversity of hominin species, the appearance of Homo (sensu stricto) and major dispersal events out of East Africa into Eurasia. During this period, ephemeral deep-freshwater lakes appeared along the whole length of the EARS, fundamentally changing the local environment. The relationship between the local environment and hominin brain expansion is less clear. The major step-wise expansion in brain size around 1.9 Ma when Homo appeared was coeval with the occurrence of ephemeral deep lakes. Subsequent incremental increases in brain size are associated with dry periods with few if any lakes. Plio-Pleistocene East African climate pulses as evinced by the paleo-lake records seem, therefore, fundamental to hominin speciation, encephalisation and migration.